William Darby was born on February 8, 1911, in Fort Smith, Arkansas. He entered the U.S. Military Academy at West Point in June 1929 and was commissioned a 2LT of Field Artillery on June 13, 1933. Darby was assigned to the 82nd Field Artillery at Fort Bliss, Texas, from June 1933 to July 1934, and then with the 1st Cavalry Division at Cloudcroft, New Mexico, from July 1934 to September 1937. He attended Field Artillery School at Fort Sill, Oklahoma, from September 1937 to June 1938. 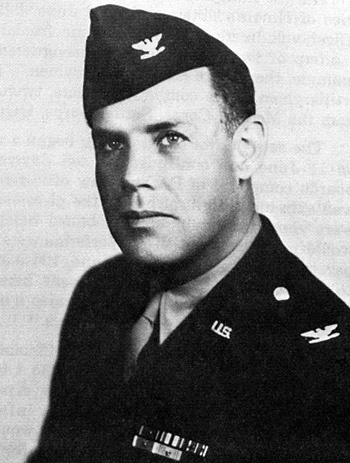 Capt Darby served at Camp Jackson, South Carolina, Fort Benning, Georgia, Camp Beauregard, Louisiana, and Fort Des Moines, Iowa, before the United States entered World War II. Darby was sent to Northern Ireland with the 34th Infantry Division in January 1942, and then organized and trained the 1st Ranger Battalion, which was activated on July 9, 1942. He commanded the 1st Ranger Battalion during the invasions of North Africa, Sicily, Salerno, and Anzio, and then returned to the United States in April 1944, where he served with Army Ground Forces and the War Department General Staff at the Pentagon. Col Darby returned to Italy in March 1945 and became Assistant Commander of the 10th Mountain Division in April 1945. 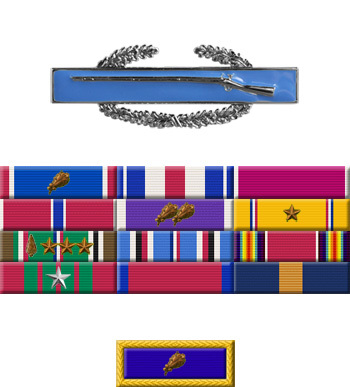 He was killed in action on April 30, 1945, and was posthumously promoted to Brigadier General, the only posthumous promotion to Flag Rank during World War II. Gen Darby was originally interred near Cisterna, Italy, but his remains were returned to the United States in 1949 and he was buried at the Fort Smith National Cemetery in Fort Smith, Arkansas. The President of the United States takes pleasure in presenting a Bronze Oak Leaf Cluster in lieu of a Second Award of the Distinguished Service Cross to William Orlando Darby (0-19133), Lieutenant Colonel, U.S. Army, for extraordinary heroism in connection with military operations against an armed enemy in action against enemy forces in July 1943. Lieutenant Colonel Darby's intrepid actions, personal bravery and zealous devotion to duty at the cost of his life, exemplify the highest traditions of the military forces of the United States and reflect great credit upon himself, his unit, and the United States Army.